This is a time of remarkable female jazz singers. So many who are so good. Undoubtedly changes in social mores have increased the pool of women willing to run the risks of being a jazz singer and the industry‘s willingness to accept them. But I think there’s more than a sociology treatise here. I think there’s magic involved, as there was with the surge in bop jazz musicians in the late 40s and great rock in the second half of the sixties. Leave it to others to explain. We get to enjoy. Think of a time when a singer simply stood next to the piano. She sings, he plays and, oh yeah, there’s a great tenor sax on some songs. 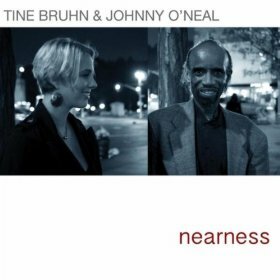 Now’s the time and Tine Bruhn makes the most of it with the marvelous jazz pianist Johnny O’Neal and young sax player, Stacy Dillard. She’s deep into the American songbook of Cole Porter, Hoagy Carmichael, Johnny Mercer and others and she has the remarkable ability to make each song hers by the end. “The Nearness of You,” from which the album title is drawn, is simply seven and a half minutes of bliss. If an album can glow with light, this one does. Jackie Ryan, I think, could sing just about anything and on this album she just about does. Jazzy, bluesy, in English and in Spanish, old classics and new compositions. Her “I Loves You Porgy” is nearly overwhelming. Hell, it is overwhelmingly beautiful. So is band mate John Clayton’s “Before We Fall In Love,” lyrics by the great Bergmans to touch the soul. Sidemen? You want sidemen: Gerald Clayton on piano, Graham Dechter on guitar, Gilbert Castellanos on a trumpet born in Mexico and journeyed to American jazz. More. I’m not even sure this is a jazz album. Not completely. Jackie kind of defies categories. She’s music. To read more reviews, posts and columns from Brian Arsenault click HERE. Next Post LIve Jazz: Amanda Brecker at Vibrato Grill Jazz…etc.